Dying is much easier than living. All you have to do is just sit and wait for death to show up in all its shrouded infamous glory. Of course, like most people if being alive is your choice of, well, living, then you might want to do a few things to prolong it. What is the single most important muscle in your body? Lazy people including famously fictitious ones such as Homer J. Simpson would suggest it is the buttock muscles or in medical terms the gluteus maximus. It allows you to sit idly for hours on end, pun intended. The bigger it is the more comfortable a perch it provides. Unfortunately, technology tells us otherwise. It turns out that the heart is the single most important muscle as it pumps blood throughout your body ensuring that you stay alive as you swallow your caffeinated drink while reading this paper. Cardiovascular exercises are ones that mainly target the heart. Walking is the simplest form while running, cycling and swimming are the variations of the more advanced. Regular cardio steadies or reduces your heart rate. That's not as alarming as it sounds. An average person's heart beats about 70 times a minute. Check your pulse by putting a finger around your wrist right below the thumb. Lance Armstrong, multiple winner of the Tour de France, has a heart rate close to half of that. That doesn't mean his heart will stop beating. It's just that his heart is so strong it can pump the same amount with less effort. Similarly, other athletes such as Formula Ones trophy boy Michael Schumacher also have a lower heart rate. In stressful situations their heart rates do not increase too much as it would for a regular person. As a result they can think clearer at times like that and react faster. Of course, you don't necessarily have to reach for such lofty goals. Cardio exercise improves your energy level, stamina, fitness and general health while at the same time stabilizing your blood pressure and keeping your weight down. In fact, regular light exercise even alleviates the pain older people suffer from arthritis. Toddlers who learn to walk just won't stop until they grow a little older and find the pleasures of fast food and cable TV combined. That's when they become slaves to their reluctant bottom. So who are the people who really need cardio exercises? The answer is just about everyone. The more sedentary your life the more you require it. You may think your brief run to catch the bus takes care of all your exercise needs. But then you go to the office and sit for hours and then get back home to sit for hours again. Age definitely isn't a factor here. In fact, it is more important for the young people as it is a form of prevention and as for older people including those nearing a century, it helps to strengthen the muscle allowing more mobility and flexibility. Start slow no matter how young and robust you think you are. Running off like a gazelle on the first day will cause you to burn out. Take a simple walk around the block. Slowly you can extend the walk to cover a few kilometers. Anything more vigorous than walking will require a warm-up so that the muscles are limber and can stretch easily. 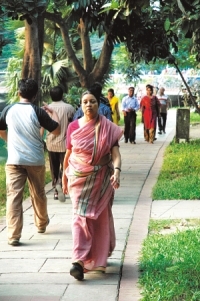 Walking itself is a warm-up so if you are intending to start jogging or even running spend 10-15 minutes walking briskly. Of course, running requires properly stretching all the separate leg muscles as well as the back. If you are a beginner then walk for a couple of weeks. Try to make it happen very day. From there you can progress into slow jogging. The best way to progress is to divide it into segments where you walk and then speed up a little into a run. Do this three times a week for 20-30 minutes. That leaves you absolutely no excuse to skip by complaining about a busy schedule. Running is much more difficult especially in the beginning. Start slow and in couple of weeks time your strides will be smoother and longer. If the breathing becomes laboured or you feel dizzy wait for a while until you feel better. The beauty of simply walking is that you cannot even complain that you have too much work to do. 20 minutes a day can work wonders and it's not a very long stretch of time considering how you can easily rack up 20 minutes just sitting on the toilet. You also need to follow your rhythm. It sounds like an inane slogan some rock star might shout out but surprisingly it has significance here. Each individual responds differently to certain times of day. Some might wake early in the morning and feel energised. Others may need a few minutes to groggily figure out that they are not the Sultan of Brunei as they had dreamed. Your may prefer to run in the evening while your friend takes a jog in the morning. Cardio exercises don't really require a venue. Start with an area that has low traffic of the fossil fuel burning kind. It wouldn't help your heart much if you were run over. If you have a big house you can start there. The rooftop is an ideal place as long as the ground isn't covered in slippery moss. But on a regular basis that same location can become boring. 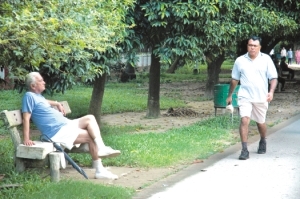 Neighbourhoods in Gulshan, Banani and Uttara are secluded enough for leisurely walks. Places like Dhanmondi and Lalmatia are great as long as your walking takes place before or after school hours. These places are packed with schools at all corners and that means smelly smoking vehicles. Parks are great but not all parks are preferable for safety reasons. Check out Dhanmondi Lake, Gulshan Lake near the American Club and Zia Uddyan. These are well populated before dark and hence safer than most other places. Of course you simply buy a treadmill and place it in your room. These can be available in a wide range of options and prices starting from 10000 and going upwards to 50000 taka for state of the art electronic motorized gizmos. The latter can offer you variable walking/running difficulties as well as giving you a personalised routine based on your height, weight and age. It's imperative to have good footwear. Simple sandals are fine when you go out for a short stroll but that won't do much in terms of a workout. Brisk walking and especially running requires cushioned shoes with soft soles that fit the length and width of your feet. Soft shoes are needed to absorb the impact to protect your ankle and knee joints. Good running shoes are available for about a 1000 taka. You might also want to invest in a waist bag to carry a small bottle of water if you don't want to carry it in your hands. When walking or running especially on humid days it is very important to prevent your body from dehydrating. Strenuous activity of any kind when the body's water content is low can lead to dizziness and nausea. Just having shoes and a water bottle may not be appropriate. Clothes are also advisable not to mention decent. Go for loose fitting items like simple cotton t-shirts and slacks. Loose fitting slacks with elasticated waists to accommodate any belly size are available at as low as 150-200 taka. Walking or running will reap great benefits especially for smokers. I have a grandfather who is 70 plus, stubbornly smokes a pack a day and coughs all the time. He also walks several miles a day and manages to do things on his own. Diet is also important. Wolfing down a burger or pizza and coke after running will be like earning a lot of money and then setting it on fire. You start of with walking and take it to several kilometers a day. Expect to see noticeable result sin about eight weeks watch as your stamina continually improves. Then you can laugh at the people waiting for the elevator as you take the stairs without running out of breath. · Consult a physician if your cardio system is a bit rusty. · The burn is a feeling athletes and first time runners get when they, well, run. It's a slightly burning sensation in their legs especially in the calf muscle. This is due to a buildup of lactic acid that goes away when you slow down. Continuing this way could lead to injuries. The saying that no pain, no gain is a bucket of bull droppings. Any kind of pain should be a sign to slow down. · Run, don't sprint. 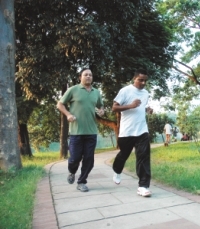 For a good cardio workout walk, run or jog at a comfortable pace. Sprinting is a fast short-lived exercise best left to athletes and muggers who want to outrun the mob lynching. · Another common myth is that of turning fat into muscle. Many believe that they can eat fatty foods and later turn the excess blubber into muscle simply by working out. You can never do that because these are two separate things. When you work out fat breaks down while a different process builds up muscle. · Never run on a full stomach. A loaded stomach sack will bounce up and down and cause pain in the abdominal regions. · Stretch before and after running. Make sure your muscles are not taut or else you could sprain them.